So, I know I’ve been busy (like a one armed paper hanger). But really, when did Google decide to stop letting me know what keywords were used to find my site? What the hell Google? This little tidbit crept up on we site owners. 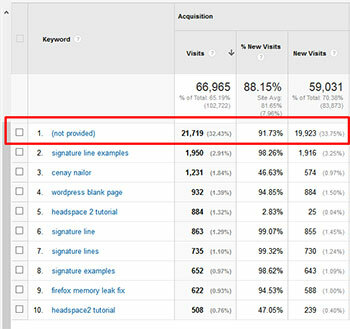 Check your Google Analytics account for keywords people use to find you. What’s in the #1 spot? I’m betting it was “(not provided)”, like it was for me. On the surface, the official reason was that this was done in the name of privacy. Google is suggesting that those searching using a secure Google connection would not want their search term to be passed on to the destination site. Except beginning in June of 2011, with the advent of Google+, anyone logged in to Google was now on the “secure” Google webpage. Meaning all of those searches were now “protected”. Google+ is Google’s “social layer” that enhances many of its online properties. Google says that it is not simply a social networking website, but also an authorship tool that associates web-content directly with its owner/author. It used to be that when another site linked to me, Google passed along the “referrer” info as well. In other words, if someone typed “signature lines” at Google and found site A, and site A linked to me, I would learn that the keyword used to find me was “signature lines” from the referring site. There are rules about what can and can’t be passed. A secure site (one with https instead of http as the protocol) will pass info to another secure site. And an unsecured site will pass data to another unsecured site. But, a secure site (Google for anyone logged into any of the Google services), won’t pass info to an unsecured site (that’s you and me). Google initially claimed the percentage of “(not provided)” keywords would only ever reach the single digits, but recently, that number has soared to over 56%. You’re signed into any Google account such as Gmail, Google Reader, YouTube, Google Drive, Google Analytics, Google Adwords or Google+ account. And before you get all giddy with excitement that you might be one of them, know this… the exceptions that Google makes are for the ADVERTISERS! Those folks who pay to advertise on Google Adwords, WILL have continued access to MY keyword data. Google is seemingly willing to overlook privacy issues when it comes to paid ads, because sites using Google Adwords continue to receive full keyword data as they always have. It would seem that Danny Sullivan was right, Google Has Put A Price On Privacy. So, I say again… What the hell Google? It’s time to rethink this policy.